Anakin moves to the dark side, Beast is unleashed on X-Men, and BraveStarr returns!? Anakin and Ahsoka go undercover to get to the bottom of a slave trading ring while Ben Tennyson confronts his arch-nemesis Vilgax. Generator Rex should be back next week, but in the mean time, enjoy some Marvel Anime: X-Men and a blast from the past that might be airing in your area! Minor spoilers ahead. Top image: Anakin in Zygerian armor & Ahsoka as a slave as they go undercover in queen's palace. Anakin goes undercover as Lars Quell to destroy the Zygerrian Slavers, with Ahsoka as his slave. 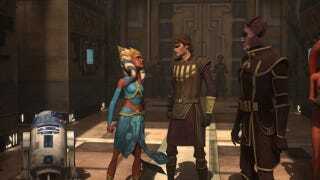 The duo meet the Zygerrian queen, with Anakin quickly winning her over with his charm. Forced to accompany the queen to a slave auction where Obi-Wan is the prize of the auction, Anakin fails to rescue Kenobi in an awesome battle where Anakin wields a whip and light saber in a nod to Indiana Jones. This leads Anakin to use some dark side tactics in on the queen, tactics shown in this clip. I'm really loving the story progression in this series - fellow Star Wars fans are lucky we have such a spectacular weekly show. Ben 10: Ultimate Alien – "A Knight to Remember "
This episode starts off with Ben, Gwen, & Kevin fighting off the Flame Keepers Circle. After defeating the Flame Keepers, they find out one of the FKC is Winston of the Forever Knights. This causes a battle between the Flame Keepers Circle and the Forever Knights, which leads to Ben taking on a new form, Eatle, and fighting his arch-enemy Vilgax. The clip of the week features the origin of the Forever Knights, done in a retro animation style. Marvel Anime: X-Men – "Conflicted"
The X-Men and Emma Frost set out in the Blackbird to investigate a series of geographic anomalies, which could also be behind several secondary mutations. En route the area, the Blackbird shot down and the group is attacked by a new U-Man. One of the best fights of the series ensues, shown in this clip, with the Beast finally getting to show off his stuff. BraveStarr – "Tunnel of Terror"
The spiritual predecessor to The Adventures of Brisco County Jr., BraveStarr is the Galactic Marshall of New Texas, a place 2000 light years from Earth. This show comes from a time period when cartoons were merely half hour advertisements for toy lines, but the toys for the BraveStarr line were AMAZING - Fort Kerium and the Laser Firing Backpack rocked. The intro to BraveStarr is shown above to give you an idea of the awesomeness you are about to experience. To keep the people of New Texas in line, BraveStarr is granted four "spirit animal powers", with the "Speed of the Puma" saving the day in this episode that original aired on October 27th, 1987. BraveStarr also features an alien deputy reminiscent of Orko from He-Man and a bipedal, talking robot horse, Thirty-Thirty. This clip introduces several of the main characters while showing off one of BraveStarr's spirit animal powers. BraveStarr still airs on Saturday mornings in some areas via the Retro Television Network and can be seen during Qubo Night Owl. Marvel Anime: X-Men airs Friday nights on G4TV. Ben 10: Ultimate Alien & Star Wars: The Clone Wars air Friday nights on the Cartoon Network. BraveStarr airs in some locations on Retro Television Network, Hulu, and during Qubo Night Owl.